Twist UV's are designed with a rotating union in the body for flexibility of installation. 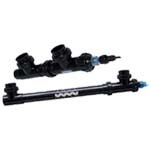 Easily place the inlet & outlet in a position to fit your plumbing. When selecting an Aqua Ultraviolet UV light, follow the columns labeled "Clarifier" if your purpose is to eliminate green water from your pond. If you intend to also eradicate floating bacteria and protozoa in your pond water then follow the columns labeled "Sterilizer".